Originally uploaded by Kevin O’Mara. I am not sure if you are aware but every Monday if I get the chance I head to the Thomas house for some red beans n’ rice. It’s just like the New Orleans tradition of RBnR except that … um … well, we’re not in New Orleans. They do it anyway. Actually, I always say “they” but last time I checked Matt doesn’t do anything really. He just makes biscuits occasionally, and the rest of the time he just sits around being pretty. We need to do something about that. A while back I told the T-brothers that I was going to make them some gumbo as a show of thanks for a beautiful coffee grinder that they kindly donated to me. I couldn’t find any decent andouille around town but I had an idea – I headed over to my bank to see Mr. Vedrine who is a native not only of Louisiana but of Ville Platte, the home of the Smoked Meats Festival. 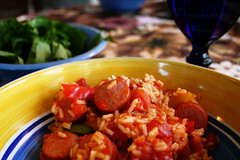 I figured if that man couldn’t find me some andouille then there was no one else to whom I could turn. Mr. Vedrine went above and beyond the call of duty and donated to me, from his personal stash not only some andouille but some tasso as well. For those of you not in the know, tasso is a smoked pork meat usually used to flavor dishes. It is also sublime. I mean, screw ham hock and salted pork … tasso will deliver you from evil. I used all the graciously donated andouille in the batch of gumbo destined for the T-brothers – probably the best gumbo I’ve ever made (thanks in no small part to the true andouille). That left me with some tasso and I got to thinking I should make some RBnR for the T-brothers, ’cause where better to use my tasso? Now I’ve made RBnR several times before and it’s just never turned out right. This is probably due to the missing ham hock or tasso or whatever seasoning meats I didn’t put in. I figured some sliced smoked sausage would save it, and I was wrong. 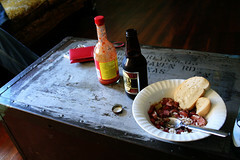 This time I did it right, this time I used tasso, and this time I made the best batch of red beans I’ve ever made. Do you see the common thread here? It’s all the beautiful meats that Mr. Vedrine gave to me. I don’t think I can thank him enough. Anyway, I took my RBnR over to their house and it was well-received. I especially enjoyed the chance to eat it alongside Mark’s always-tasty RBnR as a comparison, or as a foray into the various authentic styles of red beans. I suppose I should post the recipe, though it’s certainly nothing special. I do urge you to go to your bank and assault your banker until he or she admits that they are indeed a Louisiana native and they will procure for you some smoked meats. Take 1 lb. dried red beans. Either A.) soak overnight, or B.) submerge in water, bring to boil, and remove from heat and let sit for one hour. Once beans are done prepping, drain and replace water. Bring to boil. Saute these ingredients until onions are translucent, maybe 3-5 minutes. Throw these into the pot with the beans. Add a teaspoon or so of thyme and two bay leaves. Slice 1 lb. smoked sausage (andouille if you can get it) and throw that in the pot. Add 3/4 lb. tasso or other acceptible substitute. Make sure there’s just enough water to cover everything and bring to a boil. Once it’s boiling, reduce to a simmer, let cook for 3 hours. That’s it – it’s so simple it’s stupid, or maybe it’s criminal – take your pick. Since there’s very little flavoring it’s important to get good meats – I can’t believe it took me this long to learn that. Oh, hey, apropos of nothing – the new Tom Waits 3-CD album (albums?) ‘Orphans’ is now available for pre-order at Amazon. This is one piece of music where I am anxious to own the physical item, not just order it off of iTunes. From late November ’till some time next year you’d better not get into my car unless you’re willing to get your Waits on. Wow. I have totally forgotten how to go about doing this. What … what goes here? A recipe? Details? Who are you again? WHAT DO YOU WANT FROM ME?! Oh, so yeah, this recipe was recommended to me and the recommendation was spot-on. This is some seriously tasty stuff and pretty darned easy to make. Okay, now that I’m done bragging on my pre-prep obsessive compulsiveness I’ll get on to the rest of it. The … uh … recipe, if you will. This is stolen straight from Cooking Light but I’ve cut out all the words like “low fat” and “low sodium” because I think one should enjoy one’s food even if it is likely to kill one sooner. okay, so maybe I bought the healthy versions. You’ll never know. 1.) Cook pasta according to package instructions. Drain pasta, reserving 1/2 cup pasta water. 2.) Melt butter in a large nonstick skillet over medium-high heat. 3.) Add garlic; sauté 30 seconds. 4.) 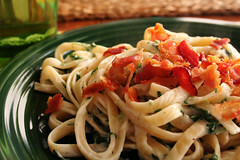 Add reserved pasta water and cream cheese, stirring with a whisk until smooth. 5.) Combine broth and flour in a small bowl, stirring with a whisk until smooth. 6.) Add flour mixture to pan, stirring with a whisk to combine; bring to a boil. Cook 2 minutes or until mixture thickens, stirring constantly. 7.) Remove from heat; add pecorino Romano, stirring until smooth. 8.) Add half-and-half, salt, and pepper. Stir in spinach. 9.) 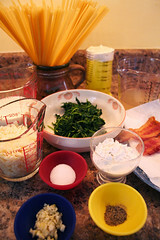 Combine cheese mixture and pasta in a large bowl, tossing to coat. 10.) Dish it out and top it with bacon. EAT. EAT EAT EAT EAT. HURT. BURST. EAT. The longer I thought about it the less it made sense to me that I was keeping two separate blogs, one for personal stuff and one for food and recipes. So! Now you must suffer the convenience of having all of my words in one place. Besides, I haven’t been cooking that many new recipes lately so you won’t be inundated with cups and tablespoons. This recipe is an old family standby – I can’t tell you how many times I’ve had it. Sometimes it can come out rather bland, but when I made it last night it was stellar. I don’t know what I did wrong, but it was right. Already I think you get the idea, but I’ll lay it out for you. 2.) While rice is cooking, sautee the meats and veggies for at least five minutes. 3.) When meat and veggies are cooked up and tender, throw in the tomatoes, hot sauce, and black pepper. 4.) Once that gets nice and simmer-ing-y, check to see if it’s too watery. If so, cook down for a while longer or sprinkle some flour for a quick fix. 5.) Add rice to meet your desired ratio of rice-to-non-rice-ness. 6.) Yell for everyone to come and get it. You must add the rice to the other stuff because this isn’t like red beans n’ rice or like gumbo where each person makes their own bowl. It’s supposed to be a cohesive dish, displaying the true culinary artistry of the chef. And now, some notes. Mom and I wondered why it was so good this time when it has a tendency to be a bit on the underwhelming side. I went in the kitchen and wrote down that I used Butterball Smoked Turkey Sausage (extra tender) and Del Monte diced tomatoes with onion and garlic. That’s the only real deviation from the regular right there. Also, Dad doesn’t care much for the celery so I left that out. I’d suggest you come eat some but I’m gonna go take care of the rest of the leftovers right now, so you’re out of luck.